What I wore to work Monday: The cream cableknit sweater from Lands' End (similar), black ankle pants from Banana Republic, black Nine West pumps, with my silver cuff (similar) and brilliant studs from Ann Taylor. 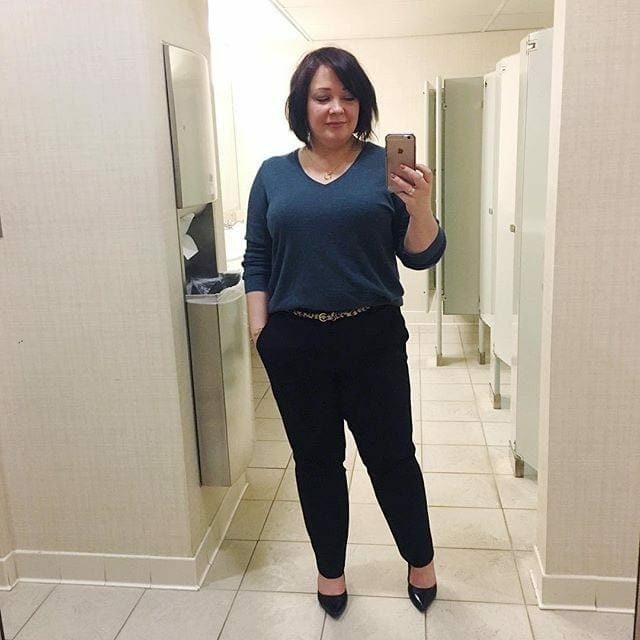 The same pants worn last week with the v-neck sweater from LOFT, my leopard calfhair belt (similar), black Nine West pumps, and I added my gold Rebecca Minkoff cuff (similar) and a gold necklace from Stella & Dot. 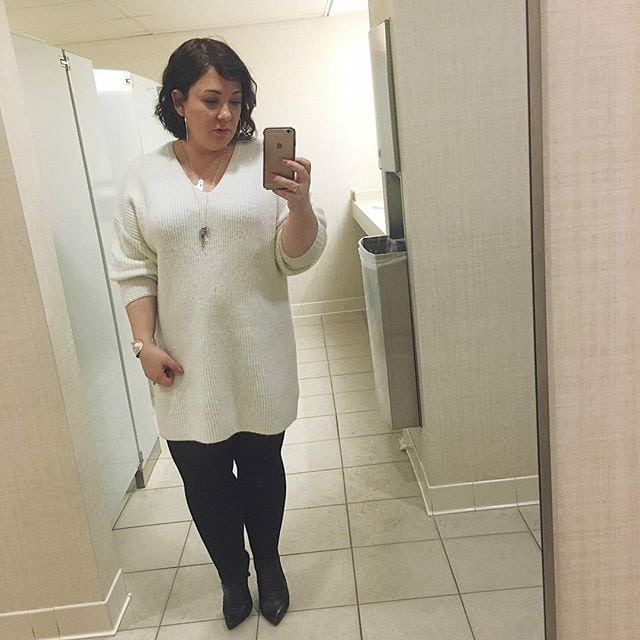 Another look from last week was the cream oversized sweater dress from Glamorous (sold out – similar) with black tights from Spanx and my black ankle booties (similar). I styled with the silver hoops, silver cuff (similar), silver initial necklace and a silver chain with various charms on it. 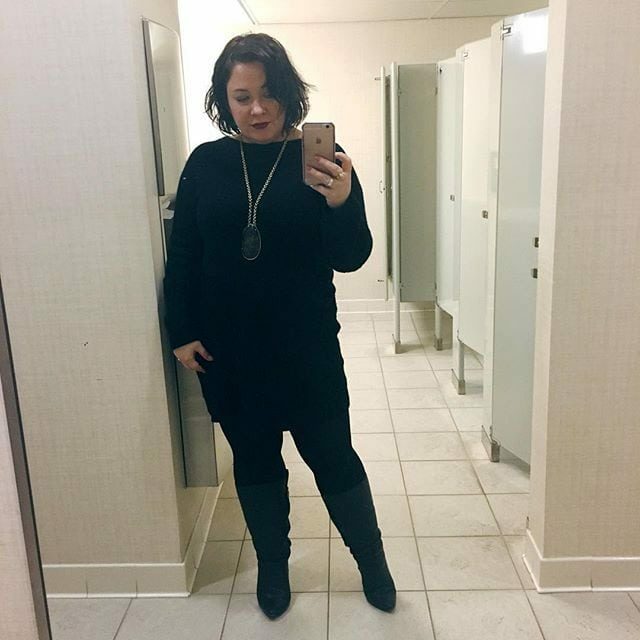 This is the black cashmere sweater dress from Nordstrom Collection (similar) with another pair of black Spanx tights, my black knee-high heeled boots and my Stella & Dot pendant (similar). This is a time where makeup is a great accessory; I added a deep wine lipstick from The Elixery to complete the look. Mega real life here, this is 9am at Target this past weekend. The black and white striped tee from J. 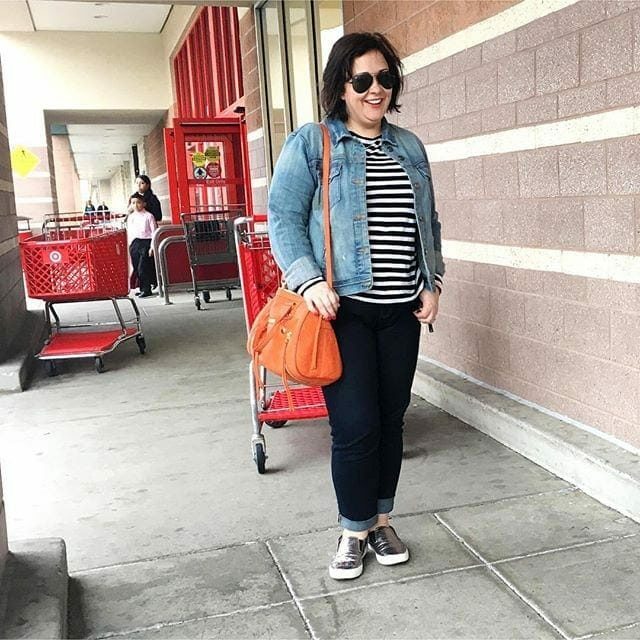 Crew Factory, denim jacket from the same retailer, my Gap Real Straight jeans cuffed, silver Supergas (similar) and an orange satchel from Botkier to add a pop of color. My Ray-Bans to finish the look. And finally, I went to brunch with a few fellow bloggers and this is what I wore. 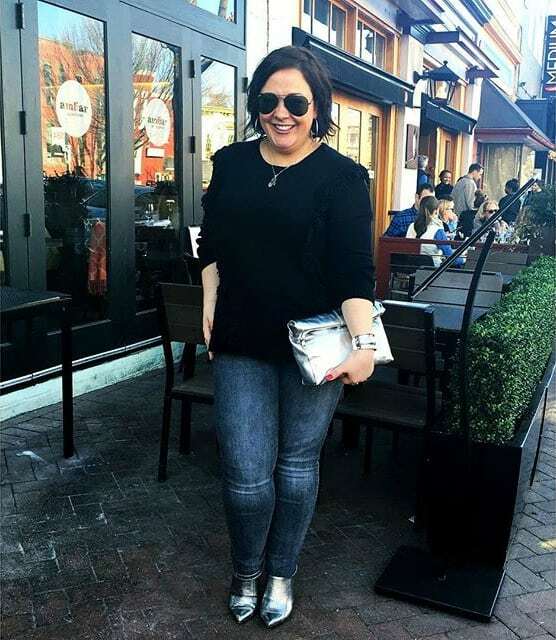 The black fringe sweater from Trouve (sold out online, similar), grey jeans from Gap, the silver Topshop clutch, my silver hoops, cuff (similar), necklace, and statement ring and I added my BCBG Max Azria silver booties from outside the capsule to make the look more fun and trendy. Ray-Bans to complete it. 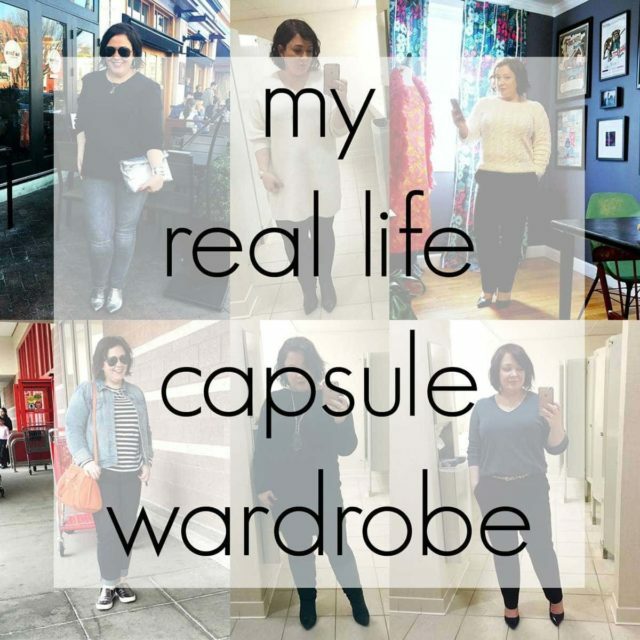 Work, weekend, and even a social occasion all with the few pieces in my real-life capsule. While I hope to capture some outfit shots with Karl and his nice camera, in the mean time follow me on Instagram where I share my looks real day and am cataloging all of them with the hashtag #WO2wintercapsule. And yep that means that come Spring I'll be doing a new one and documenting it! Next Post Friday Favorite: Samsung NX 3000 Camera – Perfect for Camera-Unsavvy Folks! Nice photos. It’s SO refreshing to see a real-life woman who doesn’t weigh 95 pounds and have the clothes pinned at the back to fit. I just discovered your blog, will be back. 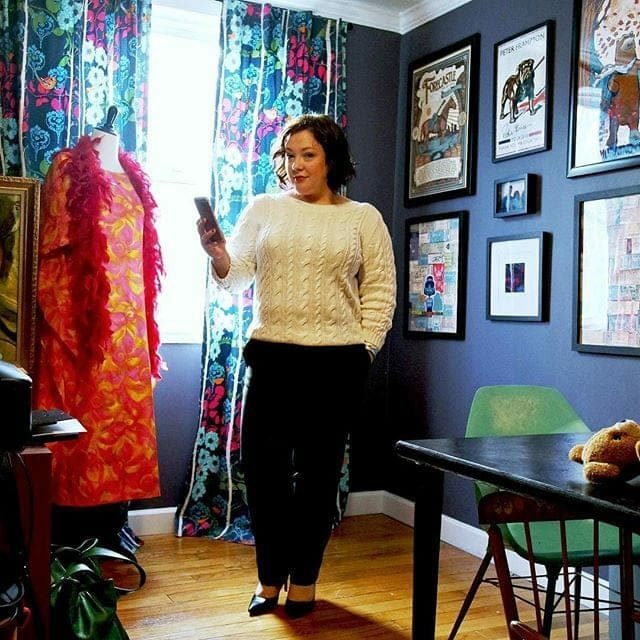 I know this was about your wardrobe, but thank you so much for sharing the inside of your spaces with us! I had forgotten how beautiful those curtains were- but I now remember you posting them so long ago. Have a wonderful week, Allie! I can’t believe how much effort you put in, every day! You look great, pretty and trendy but appropriate. It makes me realise how I’ve really let myself go and just fallen into a boring, low effort routine. Hopefully when this awful job that I hate ends, I can get a better job with less commuting and get back to looking after myself and having more fun getting dressed every day! I’m really enjoying this & your Facebook pics too. So sorry about your toe–hope you feel better soon! when you are only working with a smaller number of items, so wearing them/washing them more frequently, how often–realistically–do you find you are replacing the items? I love the idea of a capsule wardrobe and did a big shop last January–buying higher priced items (and I thought quality) than I usually do (nordstrom and J crew verses Target and Old Navy) but I’m finding now a year later the sweaters are looking shabby, I’ve got some tiny holes here and there, designer jeans with a huge rip and are now unwearable. Is this to be expected? I got ALOT of use out of all these clothes, but I thought buying higher “quality” would buy me a little more time w/ these items instead of what I’m used to w/ the cheaper retailers. Maybe I’m too rough on my clothes? Thanks for your blog–I love it! Great question. Looking at my current capsule wardrobe, I know that the grey jeans, striped shirt, teal sweater, black sweater, cream sweater dress, and black v-neck will likely be unwearable condition by this time next year based upon wear, fabrication, history with these brands. The cashmere sweater dress is already 2-3 years old, same with the leather-front pants, and the black pants and jean jacket are those kinds of fabrics that will do fine for a while. Price doesn’t equal quality, nor does a designer tag. On top of that there’s some pieces that no matter how well made because of life they won’t survive. I won’t spend a lot on things like jeans because they always wear between the thighs for me and end up with a rip there or in the knee. Unless the sweater is super thick, even a cashmere sweater gets holes and pills and starts looking crummy. I’ll spend more on something that doesn’t touch the actual body as much like a blazer or jacket because body oils and heat will break down fibers. I truly don’t see much of a difference between a J. Crew tee shirt and one from Old Navy other than shape; the material and sewing is usually equal. I’ve even bought an expensive designer tee shirt (http://www.wardrobeoxygen.com/2014/10/expensive-tee-shirts-why.html) and while the fit was perfection, even with babying it a year later the shirt looks like crap and has a hole near the belly button. I don’t know who these women are who are sporting the same jeans they bought in college, wearing crisp white shirts that are a decade old, and cashmere sweaters that look great and can be considered vintage because they were bought so long ago. Maybe they don’t sweat or spill, maybe they don’t have curves that rub against each other, possibly they spend a good portion of their free time handwashing and darning and mending and altering. I find it’s worth it to move up from Old Navy to Boden because the fit is better, the sizing more consistent, the quality usually better but I don’t think that by spending $50 instead of $5 I’ll get 10x the years of wear. However I do usually get at least twice the wear and now that I am older and softer and can’t carry off a misshapen tee and cheap jeans like I could when I was 25, I’ll gain ten times the style. And by purchasing fewer pieces I’m not shopping myself out of house and home in the process. Again, thanks for this great question, it’s something I think about on a regular basis, and a big reason why I may buy better quality than before but I just can’t go much higher in price because I can’t see the ROI. Thanks for the reply, very insightful! I would like to comment here. The price – quality topic is of great interest to me. How we arrived at the point we are now with clothing as well as other consumer products is a complex and not pretty subject. If you have an interest, I can recommend some good sources of information. I will say this, clothing quality, with a few exceptions, has declined from what it once was. A couple examples from my own life are Lands End and LL Bean. I first started purchasing clothes from them in the 90s. A lot of their garments then were made in the US. The craftsmanship of the sewing, the weight of the fabrics, the weave and yarn of knits were better than they are today. I have Lands End cotton sweaters from the 90s that still look good, haven’t torn, pilled, or faded and I have washed the sweaters 100s of times. I am not all that careful with my clothes and the old sweaters well withstood numerous washings even in laundromats. I still purchase sweaters from Lands End. When I open a new Lands End sweater I compare it to my old ones. It is very apparent that the old sweater is considerably better today, regardless of the years of use and washing. I found the similar comparisons with LL Bean garments. It’s so disheartening. I used to be able to count on both of these companies for outstanding quality and longevity, if not style. I know, the past is the past. What do we do now, today? I wish I had one really great solution but I don’t There is thrifting, both in stores and online. Sometimes one can find some true gems. But not everyone has the time, inclination, and patience for hours of searching. It is not that difficult to spend 8 hours in a thrift store and leave without a single item. Some folks sew from scratch and/or refashion used garments. I think that’s a great solution, but again it’s not for everybody. Personally I don’t have the skills or the desire to put in the time to become adept. Then too, in the past fabric was reasonably priced. A woman could create gorgeous, custom garments for not much money. Today, I doubt if you could make a dress for less than $50, maybe more. There are domestic and international small manufactures who strive to produce high quality, ethically sourced, stylish, and affordable options. I intend to pursue this avenue with hopeful enthusiasm. Allie works tirelessly to alert us to the best possible combination of available features and choices. For that I am extremely grateful. You look great, every day this week. And your posts have convinced me that I need a pair of silver shoes too. They really help make those outfits look special. Me too Christine, several pairs of silver shoes!! !